When growing outside the Season of the year will determine when it’s time to harvest. In late fall the larger leaves will yellow, die and fall off. The buds will change color depending on the strain. They may turn purplish, darken or even lighten in color. The trichome heads will turn from clear mostly clear to mostly amber. Some like to harvest the buds as they mature individually which is an excellent method. However we are harvesting at the end of the season with frost coming soon so the entire plants will be harvested. I like to attach a twist tie or a clip to hang the plant before I cut it off but it’s up to you. Using sharp clean pruners, cut the plant off at the base, be gentle with it as you take it to the processing or curing location. You can trim some of the larger fan leaves before you begin the initial curing process which will result in quicker curing but some say the flavor and intensity of the smoke may suffer a bit. So you can make that decision based on your needs or preferences at the time before you hang the plants for curing. Curing is removing the moisture, but unlike drying, it’s done as slowly as possible without mold forming. A cool, dry closet works great. Hang the plants from the base of the stems in a secure location where the smell will not be an issue. Also keep it free from moisture, insects and drafts as well as intense heat and or cold. It will likely take about 1 to 2 weeks depending on size, density and other factors. When small stems snap but the large stem still bends a little you can finish off the curing for smoking cannabis. 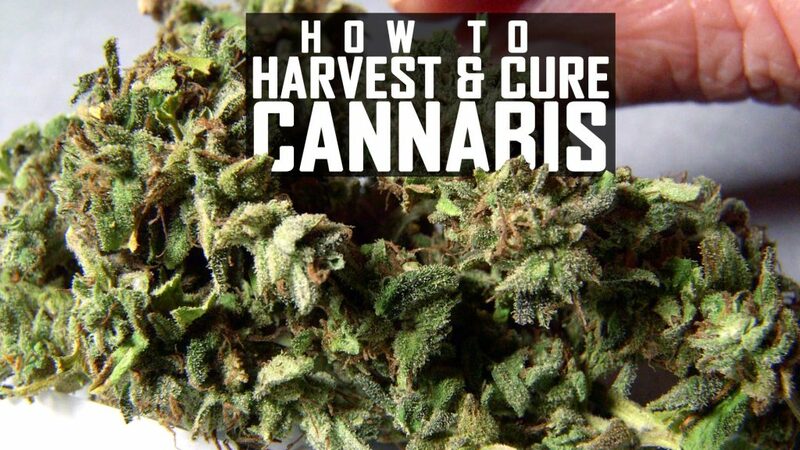 For cooking, extracting cannabis you do not need to continue with the slow cure. If you are slow curing for a smooth smoke you can use glass jars, like mason jars, to store the cannabis looseley in the jar filled only about ⅔ full. Keep in the same controlled climate condition as before for a few weeks. Open the jars to burp the air and let breathe for a few minutes every few days until fully cured to your preference for smoking. Once cured initially you can manicure the buds if you desire. If making edibles or concentrates you may decide to skip this step, or at least keep the trimming from the manicure for edibles or other uses. After manicuring is a good time to do the final curing as removing the leaves fully will help the aroma and flavor of the cured cannabis. I hope this first season of Seeds, Soil and Sun was useful and informative. Please see the entire season at the link below and stay tuned to season 2 coming in Spring 2019.